Brenesia 16 (Supl. I): 75. 1979. TYPE: Panama. Panama: north of Tocumen airport on road to Cerro Jefe, 2.5 miles north of Lago Cerro Azul, elev., ca. 700 m, Croat 77529(MO-2205477, holotype; F, K, PMA, US, isotypes; Live at MO). Epiphyte; stem 1.5-2.5 cm diam., often to 40 cm long; the leaf scars almost contiguous, ca. 2 cm wide; roots relatively few, green to greenish-brown, 2-3 mm diam. ; cataphylls subcoriaceous, to 17.5 cm long, drying brown, remaining intact, soon deciduous. LEAVES with petioles broadly and stiffly spreading, 19-70 cm long, 6-10 mm diam., subterete, obscurely and narrowly sulcate (the sulcus less than 1 mm wide); geniculum 2-2.5 cm long; blades moderately thick, ovate-triangular, narrowly to abruptly acuminate at apex,prominently lobed at base, 30-75 cm long, 16-40 cm wide, broadest at or near point of petiole attachment; the anterior lobe 25-44 cm long, the margin broadly rounded to weakly concave; the posterior lobes 10-19 cm long; the sinus spathu-late, elliptic or obovate, acute, truncate or rounded at apex, usually broader than deep; the basal veins 5-9 pairs, the first and second free, the remainder coalesced 1-8 cm; the posterior rib curved, marginal lo the sinus, 2.5-4.5 cm, the outer margin turned upward; blades semiglossy above, often broadly undulate, the lower surface semiglossy to matte; the midrib raised above and below; primary lateral veins 5-11 per side, departing midrib at 40°-50° angle, raised in valleys above, raised below; lesser veins conspicuous, flat above, weakly raised below; the collective vein arising from the first basal vein or one of the lowermost primary lateral veins, sunken above, raised below, 2-4 mm from margin. INFLORESCENCE erect-spreading; peduncles 15-40 cm long, 7-8 mm diam., terete, sometimes weakly ribbed on adaxial side, running the full length of the peduncle (continuous lo the dccur-rent spathe); spathe greenish-white to pale green, sometimes tinged purplish at base, oblong-elliptic or ovate-elliptic, moderately thin, 8-18 cm long, 2.5-5.8 cm wide, broadest just above point of petiole attachment, abruptly acuminate at apex, the margins sometimes turned downward in lower half, rounded at base then decurrent to 1 5 mm; spadix cream, while, lo pale green, usually sessile (rarely with a stipe 2-10 mm long), 8.5-24 cm long, 12-15 mm diam. at base, 10-12 mm diam. at apex; flowers weakly and irregularly 4-lobed, 2.2-3.5 mm long, 2.3-3.2 mm wide, sometimes conspicuously wider than long, the sides sometimes straight, usually jaggedly sigmoid; 8-12 flowers visible in the principal spiral, 8-15 flowers visible in the alternate spiral; tepals smooth, matte or weakly glistening with numerous minute droplets, the inner margins straight to convex, the lateral tepals 1.1-1.5 mm wide, 3-sided or more commonly 4-sided, with one lateral te-pal acute on one end and obtuse on the other (proximal and distal ends), the opposite lateral tepal being a mirror image; pistil emergent but not raised, cream or whitish and difficult to discern from the adjacent tepals; stigma round, brushlike, somewhat elevated with short dense papillae, sometimes forming minute droplets about 7 days before first anthers emerge; the first stamens exposed in 2 or 3 days throughout spadix, all stamens emerged in about 10 days after first appears, usually exserted above the tepals, 1.2-1.5 mm, held in a very tight cluster; filaments flattened, fleshy, 0.6-0.8 mm wide, slightly longer than the anther, sometimes retracting but usually remaining exserted, drying and twisting; anthers white, 0.5-0.6 mm long, 0.6-1 mm wide; thecae not divaricate; pollen pale lemon-yellow, fading dirty white. 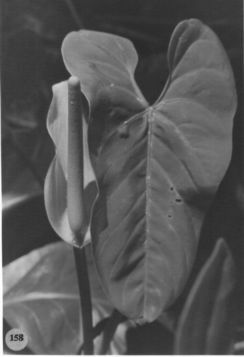 INFRUCTESCENCE arching-pendent; the spathe usually deciduous; spadix 14-44 cm long, ca. 2.5 cm diam. (with berries emerged); berries usually evenly emerged (even before maturity), narrowly ovoid, acute at apex, bright red, usually white in lower half; me-socarp gelatinous, transparent; seeds 2, white to brown with white punctations, green at apex, flattened, broadly elliptic, 3.7-4 mm long, 2.5-2.7 mm wide, ca. 2 mm thick. Figs. 157 and 158. Anthurium ravenii ranges from Honduras to the Pacific slope of Ecuador. It usually occurs in tropical wet and premontane wet forest from near sea level to 1,000 m elevation, but it has also been found in tropical moist forest in Darien Province in Panama. The species is a member of section Calomystrium and is unusual in having an orbicular, brushy, elevated stigma rather than a slitlike depressed stigma (in dried material a darkened slit-like area becomes visible). 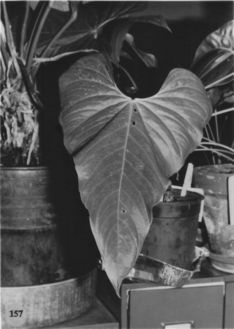 Distinguishing features include major veins that dry reddish-brown, the weak and brittle spathe, the scarcely tapered, whitish spadix, the usually long-exserted stamens, and bright red berries. The species is not close to any other species although for many years material of this species was called A. concinnatum, a completely unrelated species of higher I elevations.